As one of the most successful American science-fiction and fantasy artists, Frank Frazetta is being celebrated with a series of rounds from Osborne Precious Metals. 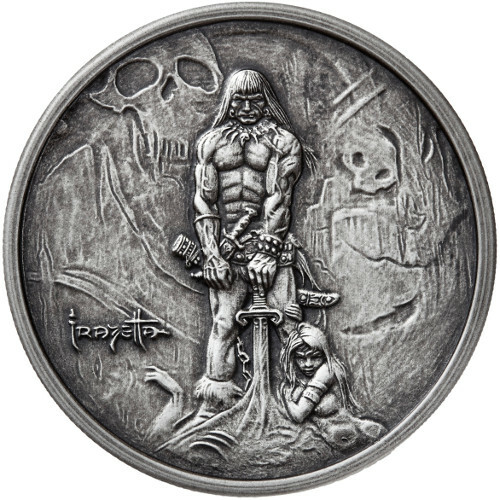 The latest release in the series, the 1 oz Antique Silver Frank Frazetta Legacy Collection Barbarian Rounds, is now available at Silver.com. Limited mintage of antique rounds set at 5,000 in total! Third release in the Legacy Collection. Contains one troy ounce of .999 pure silver in antique finish. 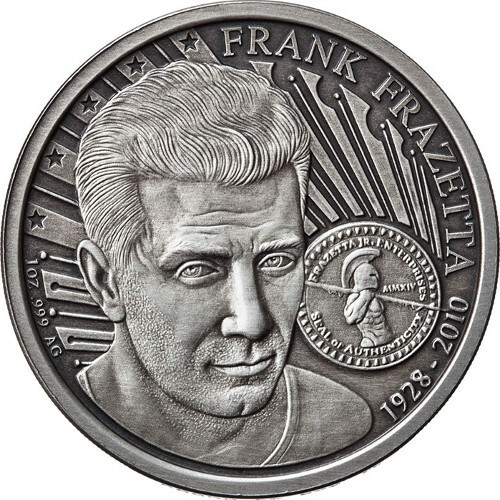 Obverse features the image of Frank Frazetta. Reverse bears the artwork of The Barbarian. Frazetta is known for a number of iconic images, including Tarzan and the Hobbit, but Conan the Barbarian is one of the most famous. This design has been recreated for a silver round series with the Barbarian design. The Barbarian is standing over a sword that is connected to the earth. There is a woman at his ankle and body parts can be seen near his feet. His muscular frame is intimidating. The obverse of this round is the same as the rest of the releases in this series. It features a portrait of Frank Frazetta himself. The engravings state his name, year of birth and year of death. The seal is included to let you know that this is based off of his work. The edges of each round also feature a serial number. Each of the silver rounds in this listing has an antique finish. This antique finish gives the round a bit of additional depth and creates an aged look on a brand new product. All of the 1 oz Antique Silver Frank Frazetta Legacy Collection Barbarian Rounds will ship in plastic capsules. These plastic capsules are meant to protect the round; they keep the surface of the rounds from getting scratched, which could affect the look of the piece. Each is also shipped with a Certificate of Authenticity, which has a matching serial number to the edge design. Please direct your questions to a Silver.com associate at 888-989-7223. You can also connect with us online through our live chat and email features.